A sojourn into the land of grey can be extremely painful for those who are certifiably color addicted. Grey can quickly turn into depressing or dull or any other sad state you can think of. Most people associate grey with negative connotations such as, “It’s a grey day.” Or “Grey skies today.” One of the worst associations is “Battleship grey.” Who wants to paint a battleship? Well, somebody might but that’s beside the point. The connotation is still unfortunate. These associations give the whole family of greys a bad name and especially the most widely used grey, Payne’s Grey. British watercolorist, William Payne (1760-1830), is believed to be the first artist to come up with this bluish grey, thus the name, Payne’s grey. According to an article in Walker’s Quarterly published by Basil Long in 1922, Payne likely devised the color by blending a combination of indigo, raw sienna and lake. Experimenting artists have come up with many combinations since to get the precise degree of bluish grey that is Payne’s grey. Carol Gillot of the blog Paris Breakfasts states she combines ultramarine and bone black for Payne’s grey in her paintings. Others have used combinations of Prussian blue and alizarin crimson for this particular grey. Personally, I have found the combination of viridian and alizarin crimson makes a nice Payne’s grey. And there is always the straight stuff right out of the tube if you prefer to spend your time painting rather than mixing. It doesn’t necessarily follow that all paintings with Payne’s grey must be negative. A little play in the land of grey can explore new depths of shadow and form. 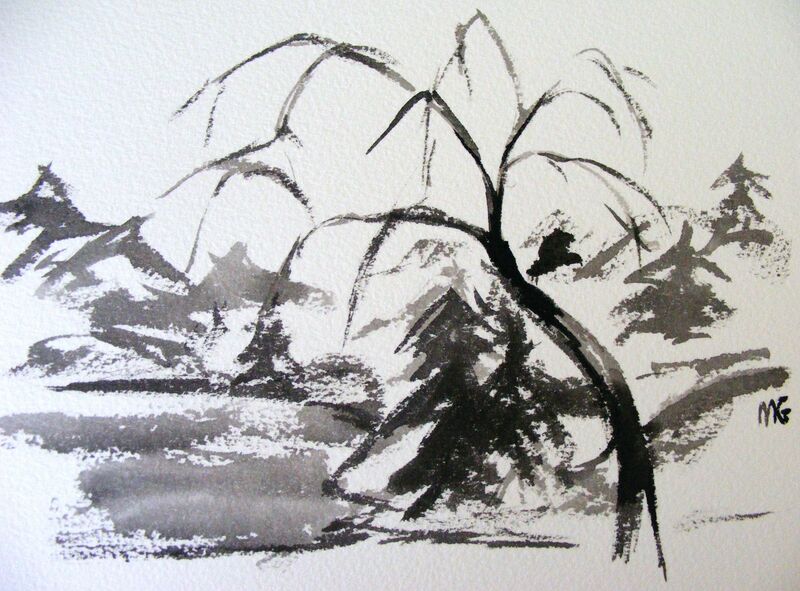 Painting strictly in grey can force the eye to see things that may otherwise be obscured by color. So paint some grey skies and grey days. Maybe even some battleships. Have fun in the land of grey and see what happens. Payne’s Grey could possibly break a total color addiction. You never know, Payne’s Grey may even become a happy color. This entry was posted in art, art education, artists inspiration, Painting, Uncategorized and tagged Art, Old Holland paint, Painting, Payne's Grey, William Payne. Bookmark the permalink. I could see where it would be extremely difficult to paint a grey “painting” and keep it vivid and interesting. Is that so in a way? That’s why I stay away from grey! I may have to paint more with grey for the sheer challenge! Well, I’d like to see you do a whole grey painting and conquerer it! Uh oh! A challenge! I may have to do that! I went off grey after we painted in our living room in what should have been a silver-grey but it turned out grey, prison grey, and that house was truly like a prison to us. And at 66,thank god I’ve got past the need to spend so long on make-up. Yes, I do put on make-up but it doesn’t take a lot of time and once it’s on I forget it for the rest of the day. Definite advantages in being a golden oldie! I’m not so much on the make up thing either but enjoyed a look at how she arrived at the color. I’m like you with the grey thing. Don’t think I could live with grey either.